Am I understanding this correctly? The servo can pull either pin by moving one direction or the other, to disconnect the rings. That big double-claw is not involved, just a mounting bracket of some s ort. Yes, the double claw as you call it is for mounting it on my custom pipe mounting rail that I use to mount my camera gimbal. 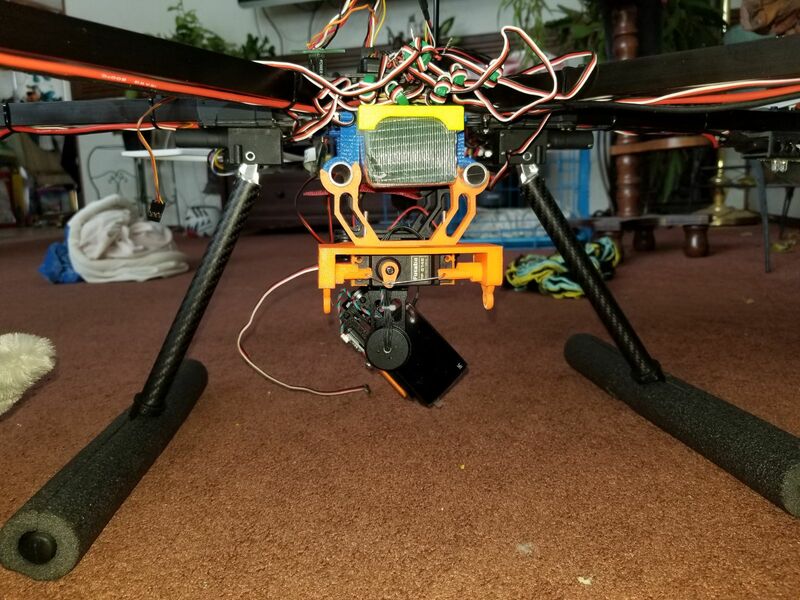 Here is a picture of it mounted on the drone behind the gimbal. You can kind of see in the picture some similar claws made in black ABS behind the orange ones. Those are the ones mounting my camera gimbal. that you see behind the drop mechanism. This picture view is from the back of the drone. With a 3 position switch on my remote, the center position will keep both pins locked. When you flip the switch in either direction, the servo will move left or right to release the payloads.